Since the beginning of the industrial revolution, the release of carbon dioxide (CO2) from humankind’s industrial and agricultural activities has increased the amount of CO2 in the atmosphere. The oceans currently absorb about a third of human-created CO2 emissions, roughly 22 million tons a day.When carbon dioxide dissolves in this ocean, carbonic acid is formed. What changes in the pH of ocean has occured? On the pH scale, which runs from 0 to 14, solutions with low numbers are considered acidic and those with higher numbers are basic. Seven is neutral. So far, ocean pH has dropped from 8.2 to 8.1 since the industrial revolution, and is expected by fall another 0.3 to 0.4 pH units by the end of the century. But this is just a small change in pH. Is it that worrisome? A drop in pH of 0.1 might not seem like a lot, but the pH scale, like the Richter scale for measuring earthquakes, is logarithmic. For example, pH 4 is ten times more acidic than pH 5 and 100 times (10 times 10) more acidic than pH 6. Many chemical reactions, including those that are essential for life, are sensitive to small changes in pH. In humans, for example, normal blood pH ranges between 7.35 and 7.45. A drop in blood pH of 0.2-0.3 can cause seizures, comas, and even death. Similarly, a small change in the pH of seawater can have harmful effects on marine life, impacting chemical communication, reproduction, and growth. Okay, but ocean absorbing CO2 is good for the atmosphere as it reduces global warming. So, why is there a need to worry? Initially, many scientists focused on the benefits of the ocean removing this greenhouse gas from the atmosphere. At first, scientists thought that this might be a good thing because it leaves less carbon dioxide in the air to warm the planet. But in the past decade, they’ve realized that this slowed warming has come at the cost of changing the ocean’s chemistry. Equally worrisome is the fact that as the oceans continue to absorb more CO2, their capacity as a carbon storehouse could diminish. That means more of the carbon dioxide we emit will remain in the atmosphere, further aggravating global climate change. ocean acidification will reduce the ocean’s capacity to absorb anthropogenic CO2, which will exacerbate climate change. Ocean acidification is sometimes called “climate change’s evil twin,” and for good reason: it’s a significant and harmful consequence of excess carbon dioxide in the atmosphere that we don’t see or feel because its effects are happening underwater. Shell-forming organisms including corals, oysters, shrimp, lobster, mussels will have difficulty in forming their shells. Why ? To understand it, let us look at the chemistry behind shell formation. The shells of these organims are mainly made up of calcium carbonate. Carbonate ion is a key component of calcium carbonate (CaCO3) shells. To make calcium carbonate, shell-building marine animals such as corals and oysters combine a calcium ion (Ca+2) with carbonate (CO3-2) from surrounding seawater, releasing carbon dioxide and water in the process. But due to ocean acidification, there will be an increase in H+ ions in the water. Like calcium ions, hydrogen ions tend to bond with carbonate—but they have a greater attraction to carbonate than calcium. When two hydrogens bond with carbonate, a new molecule called bicarbonate (2HCO3-) is formed. Shell-building organisms can’t extract the carbonate ion they need from bicarbonate, preventing them from using that carbonate to grow new shell. In this way, the hydrogen essentially binds up the carbonate ions, making it harder for shelled animals to build their homes. Even if animals are able to build skeletons in more acidic water, they may have to spend more energy to do so, taking away resources from other activities like reproduction. If there are too many hydrogen ions around and not enough molecules for them to bond with, they can even begin breaking existing calcium carbonate molecules apart—dissolving shells that already exist. 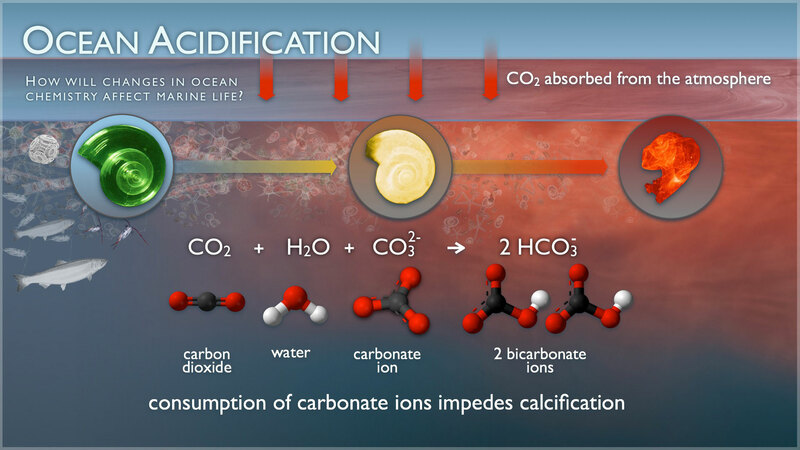 In short, ocean acidification binds up carbonate ions and makes them less abundant—ions that corals, oysters, mussels, and many other shelled organisms need to build shells and skeletons. Mussels are expected to grow less shell by 25 percent by the end of the century. Mussels’ byssal threads, with which they famously cling to rocks in the pounding surf, can’t hold on as well in acidic water. Urchins and starfish aren’t as well studied, but they build their shell-like parts from high-magnesium calcite, a type of calcium carbonate that dissolves even more quickly than the aragonite form of calcium carbonate that corals use. This means a weaker shell for these organisms, increasing the chance of being crushed or eaten. Reproductive failure in oysters – Oysters larvae fail to even begin growing their shells. In their first 48 hours of life, oyster larvae undergo a massive growth spurt, building their shells quickly so they can start feeding. But the more acidic seawater eats away at their shells before they can form; this has already caused massive oyster die-offs in the U.S. Pacific Northwest. As we have seen, the shell building process gets impacted by acidification and corals will have diffioculty surviving. Acidification may limit coral growth by corroding pre-existing coral skeletons while simultaneously slowing the growth of new ones, and the weaker reefs that result will be more vulnerable to erosion. While fish don’t have shells, they will still feel the effects of acidification. a fish is also sensitive to pH and has to put its body into overdrive to bring its chemistry back to normal. To do so, it will burn extra energy to excrete the excess acid out of its blood through its gills, kidneys and intestines. It might not seem like this would use a lot of energy, but even a slight increase reduces the energy a fish has to take care of other tasks, such as digesting food, swimming rapidly to escape predators or catch food, and reproducing. It can also slow fishes growth. There are two major types of zooplankton (tiny drifting animals) that build shells made of calcium carbonate: foraminifera and pteropods. The shells of pteropods are already dissolving in the Southern Ocean, where more acidic water from the deep sea rises to the surface, hastening the effects of acidification caused by human-derived carbon dioxide. Like corals, these sea snails are particularly susceptible because their shells are made of aragonite, a delicate form of calcium carbonate that is 50 percent more soluble in seawater. Foraminifera do not handle higher acidity very well, as their shells dissolve rapidly. Ocean acidification could affect marine food webs and lead to substantial changes in commercial fish stocks, threatening protein supply and food security for millions of people as well as the multi-billion dollar fishing industry. Ocean acidification related changes could affect a wealth of marine goods and services, such as our ability to use the ocean to manage waste, to provide chemicals to make new medicines, and to benefit from its natural capacity to regulate climate. Plants and many algae may thrive under acidic conditions. These organisms make their energy from combining sunlight and carbon dioxide—so more carbon dioxide in the water doesn’t hurt them, but helps. Seagrasses form shallow-water ecosystems along coasts that serve as nurseries for many larger fish, and can be home to thousands of different organisms. Under more acidic lab conditions, they were able to reproduce better, grow taller, and grow deeper roots—all good things.